Childers Sotheby’s International Realty and Mastercraft Iron, Inc.
What may appear to be as different as apples and oranges in building industry circles is in reality the very successful partnership of Lee Childers and Pete Stagaard. This affable and energetic duo teams up to establish exquisite low-density and custom-home communities in locations to which the most elite buyers are drawn. Lee is the founder and President of Childers Sotheby’s International Realty. Pete presides over Mastercraft Iron, Inc.
Good friends for over 25 years, Lee and Pete have created outstanding Jersey Shore projects. The Olde Seaport project is the culmination of their creativity and enthusiasm for not only awakening the immediate building site with elegant housing, but also for generating acceptance of the project from the community at large. Nearing extinction, inventory of buildable land so close to the water continues to affect the perception of existing residents and municipalities toward builders. Creating a waterside community in an already densely inhabited area could raise the hackles of everyone from the borough’s mailroom clerk to homeowners old and new at planning board gatherings. Lee and Pete effectively challenged – if not completely defused – this prevailing anti-builder sentiment by presenting what would evolve into a thoroughly admired site plan and resoundingly acclaimed home designs. Still, the team had to rehash the entire approval process. Upon presentation of their site plan and product renderings, however, “The borough and everyone at the meeting loved it,” Lee said. “It was unbelievably well received,” added Pete, a 30+ year veteran of his craft. Other amenities run from private elevators to custom granite kitchen countertops and high-end Bosch appliances. “These are certainly more common in ‘landlocked’ developments, but they are important functional necessities for our kind of buyers,” said Lee. 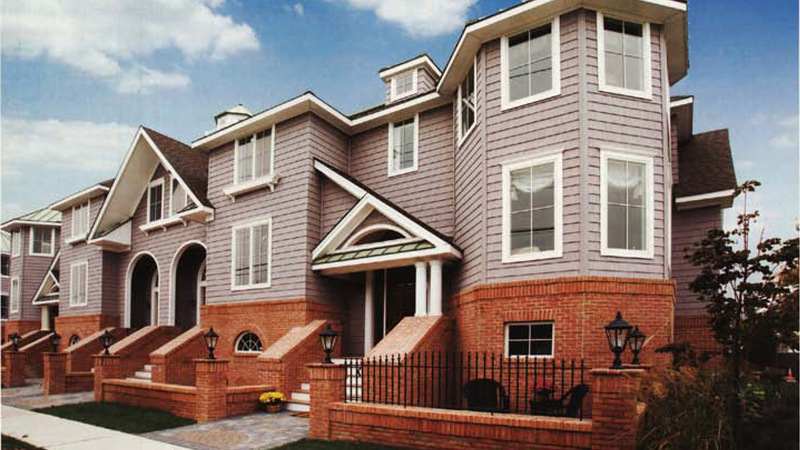 Designed in two, four-unit banks, the townhomes boast marine-defiant vinyl shakes that replicate their classic cedar ancestors, vertically exaggerated windows (as in Victorian, and lots of them) and a crow’s nest with a lighthouse-style base crowning the center of each bank. Every unit enjoys two levels of covered balconies recessed into the façade. A staple of Jersey Shore real estate marketing, Childers Sotheby’s International Realty brings home buyers and sellers together throughout the Shore area. The company employees 50 licensed real estate agents and support staff at five strategically located offices in Point Pleasant Beach, Normandy Beach, Lavallette, Bay Head and Seaside Park. A new flagship office is under construction at a mixed-use project the team is developing on Rt. 35 in Point Pleasant Beach. While the office will face the highway, five luxury townhomes and a swimming pool will be built on its opposite side. Mastercraft Iron, Inc. is a midsized fabricator of structural steel and miscellaneous iron products. The firm employs four project managers and 15 trades in its shop, providing welding and fabrication services to builders and developers. The company has completed the structural steel requirements on numerous schools, office buildings, libraries, parking garages and some of the largest homes in the state of New Jersey. Mastercraft is currently performing rehab work at Convention Hall in Asbury Park as part of the city’s ongoing redevelopment. Some of the company’s more interesting finished projects entail the new handrails at Rutgers Stadium, some prison work and the restoration of historic Barnegat Lighthouse on Long Beach Island. “The lighthouse project was particularly challenging, if not for the winds, for the more than 170-foot heights we had to deal with,” said Pete. As a team, Lee and Pete are also responsible for two upscale single-family projects located just west of Atlantic City, in Galloway Township, Leeds Point Estates is a high-end, 24-home subdivision at which the team built about half of the custom homes and facilitated road and utility infrastructure. Park Place is a 24-home enclave of custom residences sited adjacent to the Galloway National Golf Club. Mastercraft Iron, Inc. is based at 1111 10th Ave. in Neptune. Call (732) 988-3113 or e-mail pstagaard@mciron.com for more information.